It's not DISABILITY; It's THIS ABILITY I stood in amazement as I watched the 33-year old Nigerian athlete, Yakubu Adesokan break the world record in the 2012 London Paralympics in the 48 category by lifting 178kg, which is over three times his body weight. What astonished me most was that he achieved what his ablebodied counterparts from the same country couldn't achieve. 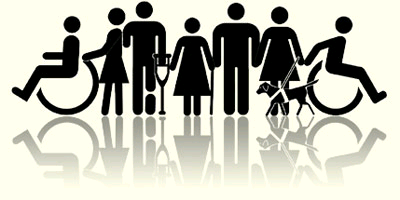 Many people today view individuals with disabilities as different people based upon their appearance and behaviours. This kind of viewpoint is disparaging. Most a times when people look at others with a disability they only see what they cannot do. Why is that? As with anyone else we all have our strengths and weaknesses. You have strengths. You have weaknesses. Why I am emphasizing on this is because we often look at others in a negative fashion and we should not do so (or rather we should stop doing it). We are all great people. We all can contribute to make the system of human race better. The struggles we face in life are challenging, but we should not be limited by our weaknesses or disabilities. Instead, we should search out our strength and abilities and contribute them to better the lives of our fellow humans. Don't let your disability stop you from doing anything. Though people may doubt your abilities, try and prove them wrong by making use of those abilities. Transform the negative thoughts of people towards you into motivation and drive. You can achieve anything when you put your mind to it. In a situation you find the word "DISABILITY", all you just need to do is to take your chisel and hammer and knock off "DIS" to get the result "ABILITY". Who ever knew, who ever thought that Franklin Roosevelt would become the president of USA being disabled? Had it been he resigned to fate, the newspaper would have changed its headline from: "Franklin Delano Roosevelt, The President" to "A countryman Who Committed Suicide." Who ever knew, who even thought that Helen Keller would later be acclaimed a scholar, philosopher, author, motion picture actress and lecturer? She disproved those who thought she was a never-do-well and changed such disabilities like blindness, deafness and dumbness into what nobody ever imagined of her. Think of Nick Vujicic, a young man who was born without arms or legs. He is now a minister sharing his story and inspiring people of all faiths with his message of love and hope. Stevie Wonder is a blind man but he is a re-nowned musician who plays piano like hell. The ability in every Disability can make you the cynosure of all eyes. You can use it to make a difference in our world. Lose the sight of your disability and focus on your abilities. We all have different abilities and we should use them for what we are truly passionate for in life. We all can make a difference in the world, no matter how little or big the difference is. Yes, you can make a difference! Here is my conviction: it's not DISABILITY; it's THIS ABILITY.